Homepage / Cat / Is it Ok for a Dog to Eat Cat Food? 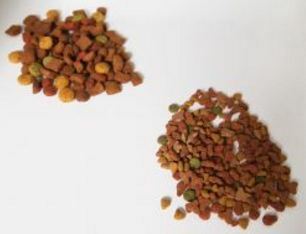 Is it ok for a dog to eat cat food – When one has both dog (s) and cat (s), one might sometimes be tempted to give them the same thing to eat? So is it bad for the dog to eat the cat’s croquettes? And for the cat, is it safe for him to eat the dog’s croquettes? We hear a lot of different things about this, but what really is it? The cat is almost exclusively carnivorous (except for the catnip …) and has an indispensable need of protein that it finds in nature by eating mice, birds etc. The daily need for protein for an adult cat is 26% (and not far from 30% for the kitten) while for the adult dog The protein need will be 18% (and 22% for the puppy). The cat food will be more protein but also more fat than the dog’s, which will mean that it would be much more difficult to digest for the dog. On the other hand, the dog’s food includes more cereals, which are more difficult to assimilate by the cat. The fat metabolism is also different in cat and dog, the cat assimilates much more easily the fats that become one of its main sources of energy, the cat food, therefore, has a much more important fat content than dog food. The cat food will, therefore, be inappropriate for the dog, posing digestion problems and promoting obesity if he eats it on a regular basis. The cat needs taurine, which is a derivative of amino acid. Dog croquettes have a lower level of taurine than cats, which would cause deficiencies for the cat if its diet consisted of dog croquettes. The cat just like the dog synthesizes taurine, but unlike the dog, this synthesis is not a sufficient contribution for its organism and it is thanks to a food rich in taurine (which is in its croquettes, in mice etc) that it will compensate for this lack. A lack of taurine can promote blindness and heart disease. My dog ate the cat’s croquettes: Is it serious? If the dog has just swallowed the cat’s bowl, don’t panic, but just make sure to put the cat’s croquettes in height so that the dog does not do it daily. The cat’s croquettes being too greasy and energetic for him, this could cause him problems with obesity and digestion. Be careful if you have a puppy and eat the cat’s croquettes! The cat’s croquettes more acidified than those of the dog will be bad for its growth. My cat ate the dog’s croquettes: Is it serious? As you may have seen above, the cat has different or additional needs in relation to the dog. If accidentally, the cat eats the dog’s croquettes, no reason to panic, the important thing is that it does not happen on a regular basis. Otherwise, health problems will be promoted, such as heart failure, blindness, reproductive problems. Read This Article: Can dogs eat cheese?